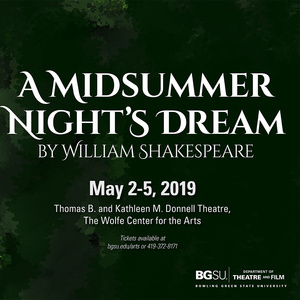 The Department of Theatre and Film presents "A Midsummer Night's Dream," considered to be one of William Shakespeare's most beloved and enduring plays. Theseus, the Duke of Athens, is preparing for his marriage to Hippolyta, Queen of the Amazons, A courtier seeks the Duke's intervention because his daughter, Hermia, will not agree to his choice of Demetrius as a husband: she's in love with Lysander. A pre-performance promenade event in the Wolfe Center lobby for the Friday, May 3 performance will enhance your experience of "A Midsummer Night's Dream." Please plan to visit the lobby before the show, where you can visit with student artists, listen to creative writers, enjoy music and hear from the play's production team about the concept development of the costumes, sets and lights for the production before you see it. The pre-performance event, which will start at 7 p.m., is free. Tickets for the show are available online. Advanced tickets are $15 for adults & $5 for students and children; all tickets on the day of the performance are $20.